This is a method whereby damaged areas of carpet can be removed tuft by tuft and new ones inserted using a needle and thread, giving a totally invisible repair. Typical examples of this process would be used for cigarette burns, moths, manufacturing problems and coals jumping from an open fireplace etc. This option would be more expensive than a patch insertion due to the time it takes to sew each individual tuft. If no spare carpet is available to carry out the repair we are able to lift up the edge of carpet and remove good tufts from the area that fits under the gripper rod and would therefore also be invisible when completed.. Re tufting is only possible on secondary backed and woven carpets. Felt, rubber and foam backed carpets cannot be repaired by this method as the backing does not have sufficient strength or density to take the new tufts. 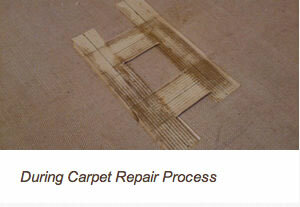 To carry out this method of repair we need to work from the back of the carpet to cut out a section using a template. This normally involves moving furniture to allow enough space to turn the damaged piece over. 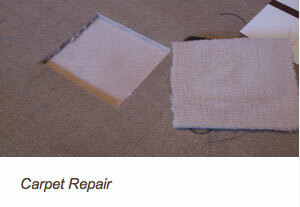 A new piece is then made using a spare section of carpet, preferably a door mat. If the spare carpet is in the loft or a cupboard, due to the lack of light in those areas there may be a colour variance so although better than the stain or burn, the patch will be quite visible at first but it will blend in over time. 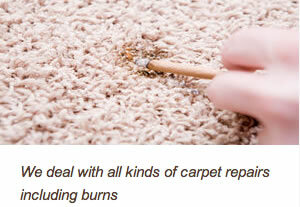 It is also a good idea to clean the carpet to blend it in more efficiently. The replacement patch in inserted using high strength heat seam tape and heat seam iron. The carpet is then refitted into place and special patching tools are used to align the tufts to make the area as invisible as possible. Any damaged area larger than a 50 pence piece would have to have a patch repair as re tufting would give insufficient strength and much, much more expensive. With regard to felt, rubber and foam backed carpets. They can only be repaired using double sided sticky tape. This will help solve a problem should you be renting a property and need to please the landlord, but will certainly not be as permanent or invisible, but will depend greatly on the quality of the carpet.